Happy New Year to you all. I hope you all had a lovely Christmas and New Year. The Friday before Christmas saw Andrew Churcher reach the grand old age of 40 in some style - I helped him to carve a pig he had roasted. this was then served to his guests in one of his barns. That was an excellent night that ended some time shortly before breakfast on the Saturday! I spent Christmas Eve visiting a few friends and followed this up with an excellent meal at The Crabtree. 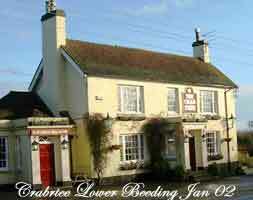 With Jeremy’s now ensconced at Borde Hill, the Crabtree has been taken over by a couple from The Greets in Warnham. Three of us had a very enjoyable meal - the portions were enormous, which is no bad thing! The Crabtree have a scheme whereby you get 20% of the next meal you purchase from them - check this offer out as the food is worth it! 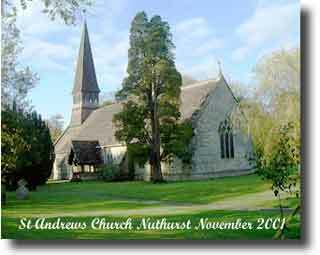 Later that evening we repaired home for a few sharpeners and decided to attend the Midnight Service at St. Andrews Church in Nuthurst. Five of us decided on a cunning plan to arrive extra-early at the church in order to get some decent seats and duly turned up at 11.25 pm-only to find no parking and the church three quarters full! Apparently it had been decided to commence proceedings at 11:30 pm sharp, presumably to deter the "beer-enabled" worshippers from the Black Horse! This tactic was an obvious success as everyone inside was sober - unlike the previous year when a few revellers managed to sneak past the two mean-looking septuagenarian bouncers. New Year saw the skies clear and the barometer soar - a sure sign of cold weather. the temperatures duly plummeted and for several days Sussex was rarely - and even then only barely - above freezing. During the first week of this year we had snow for several days and thick ice on everyone’s ponds - great weather for pigeon shooting! A message was left on our answer phone inviting us to the shindig at The Black Horse nightclub. Sadly we missed the call. Apparently it was a pretty splendid night by all accounts. I have see no sign of the escaped deer - has anyone else? Answers on a postcard please. And I was so looking forward to venison! you all are, I am sure. English Nature, The Woodland Trust and the Sussex Wildlife Trust are among the organisations who have joined in an attempt to have a planning application turned down for an abattoir at Blackstone Gate Wood near Woodmancote, a probable site of Ancient Woodland.. Whilst few can deny the desirability of more local abattoirs, the protesters object to the development on a site of environmental and conservation value, where redundant farm buildings may be more suitable, and planning consent has recently been granted for an abattoir only three miles away. A record 720 letters have been received by Horsham District Council but the outcome is not clear; if you have any interest in influencing their decision then letters should be sent to: Gary Peck, Horsham District Council, Planning Department, Park House, North St.,Horsham, W. Sussex, RH12 1RL. a) Firstly there is the issue of development on ancient woods - definitely not a good idea. 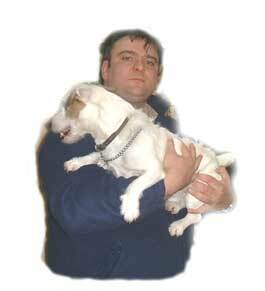 b) Then there is the issue of more local abattoirs - animal welfare is improved because journey times are cut. Jobs should be created and local producers should be able to reduce their travel costs substantially. No downside here at all I think, although two within three miles of each other won't impress the McCartneys one little bit. c) Local residents. I can't see many locals being in favour of this scheme - I am not too sure I would be if there was one in my back yard. After all, who wouldn't be worried by the prospect of flies buzzing around rotting offal in the heat of the summer? Actually, I think most abattoirs operate under very strict guidelines so hygiene shouldn't be an issue. Bit of a sticky one, this, so I'll move on rapidly. d) Increase in road use. The roads around here all look fairly rural. I know the problems we have with lorries trundling along Park Lane so it can be a problem. It might seem like too simple a solution, but couldn't the location of the abattoir be changed slightly??? 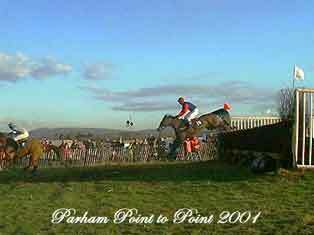 5) Point to Point Season. Hurrah! the point to point season will soon be with us once more. the two local events are at Parham in February and March. The even better news is that I will be running a bar at the March event. the full point to point calendar is here. 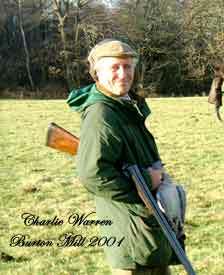 The Countryside Alliance are hosting a sportsman's (and woman's) evening in March. This prestigious event (£75 per ticket) is open to all. It will be held at Christ's Hospital. There will be a "Jazz reception" ("Mike Piggott Trio" as with me down the Black last week. DT), a slap up meal featuring a lot of local produce, a cabaret by the internationally renowned Kit and The Widow, speakers, auction, raffle, smoking lounge etc. Be there.